Note: The 507 SC and the 507SCE, Mount the same way. The Monitors are slightly different. 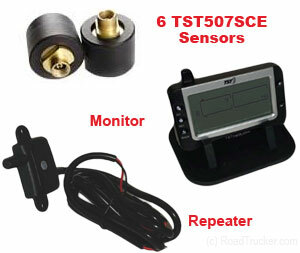 The easily programmable TST507SCE6 Trucking Tire Pressure Monitoring System comes w/6 tire sensors for tractors with Super Singles, RV or Tow Vehicles. Kit comes with a Repeater. 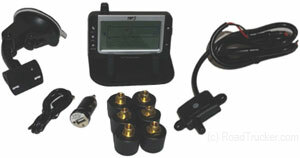 A Repeater Consist of a Receiver, an Amplifier and Transmitter. Unlike most Amplifiers, the Repeater eliminates unwanted noise . 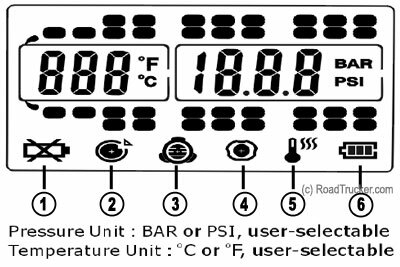 Flashing LED light, audible alarm, and alert icon notifications present instantaneously when pressure or temperature exceed pre-set thresholds, or when tire pressure falls to an unacceptable level.